She has tried before and didn't have the dexterity, until this morning - when she suddenly decided she'd like to knit - and it just clicked. Although I knit Continental, I've shown her how to knit "Granny style" (which is how a friend refers to 'throwing' the yarn), as that's how I'll be starting with the children at Knitting Club on Monday, and she's coming with me. I'm hoping it'll take just a couple of sessions for everyone to make one of these as it's such a simple project, and it won't matter too much about tension or holes. Having the opportunity to teach other children to knit it a real pleasure but I have to be honest and say there's something extra special about seeing your own child doing it. The joy in her face as she mastered the stitch, and how she ran around the house in delight to show everyone what she had done, is something that I will always remember. 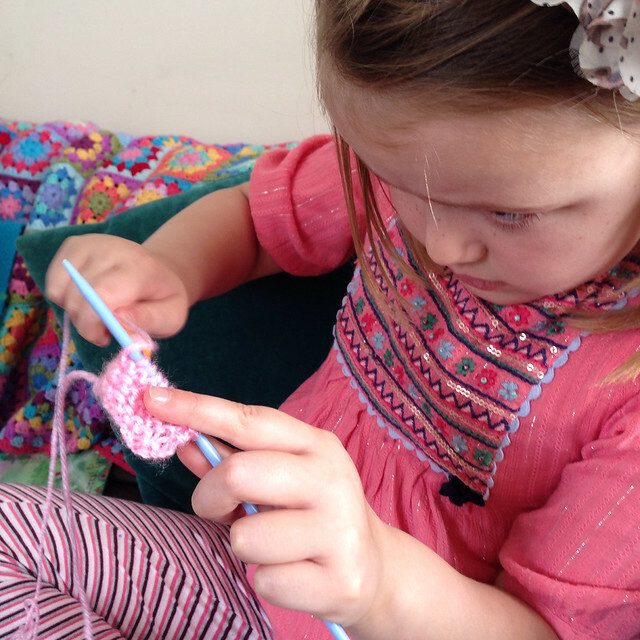 Have you taught any kids to knit? I'd love to hear your experiences too. Hi Sarah, yes, it have taught my 2 girls (6&7) to knit - not easy, but they have got it now. The 7 year old amazes me by how well she does it, even if it's very tight!! I watch in wonder as she keeps the stitches on the needles despite being pulling almost to breaking point - but it works for her so I'm not arguing!!! She can knit and purl, which I think is a lot easier!!! It's been interesting to see the different techniques different children use to hold their needles and work the yarn! Brilliant. She will always remember who taught her to knit. I am forever grateful to an aunt who sent me a knitting kit when I was 7. It's thanks to her that I learned as my mother would never have taught me if that kit hadn't arrived. Great idea to make a puppet. 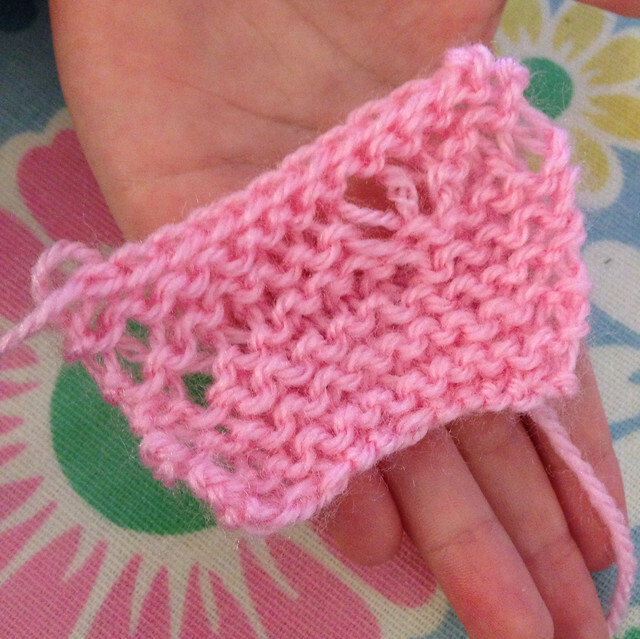 IWhen I teach someone to knit, I always teach the English/throwing method. It's easier. I hope to buy my girls some straight knitting needles with cute decor on top. I think it'll be easier for them to knit with. I've taught a few girls to knit but I don't think they've kept it up. With the kids who didn't have any knitting experience at all, we showed them Continental and they just picked it up easily, but those who had some prior experience, or who had watched their family knit found it too confusing to start with that so we switched them to English knitting. For ease, I'm going to start them all on English this time, and will teach continental to anyone with aptitude or interest as an extra. My granddaughter is 4years old. Do you think I could teach her, is she old enough? My daughters were never interested but she is. She enjoys making those bracelets with the rubber bands. I have always used the English method but tried Continental and did not get on with it at all. A small finger puppet for the first project is a brilliant idea! When I taught my daughter to knit the hardest thing for her were the long straight needles. they were so awkward. so I glued pretty beads we picked out together onto the ends of dp needles and we had a set of nice short needles for her small hands. Much better. 35 years later we are still working on projects together. When she visited last week I showed her how to crochet and set her up with a hook and scraps to make squares for my granny blanket. Agreed. I have asked all the children to come equipped with needles no longer that 15cm - the long ones are so heavy! I can't even knit with anything longer than 15cm which is why I usually use circulars for everything. It's lovely that you are still working on projects together! I taught my daughter to knit when she was younger, and now at nearly 20 she is really good. I can't remember much about it except it took a while for her to get the hang of it and a LOT of patience on my part - totally worth it though! It is a great idea to create the puppet theatre as it will can both develop their knitting skills and of course imagination. And even more, when you organize a puppet play they will learn to express their thoughts and it is the best essay help . But I do love this idea not for getting all this skills but for the useful time spent with your children when you can be with them and hear them. As a rule we are so busy for such pleasant moments. 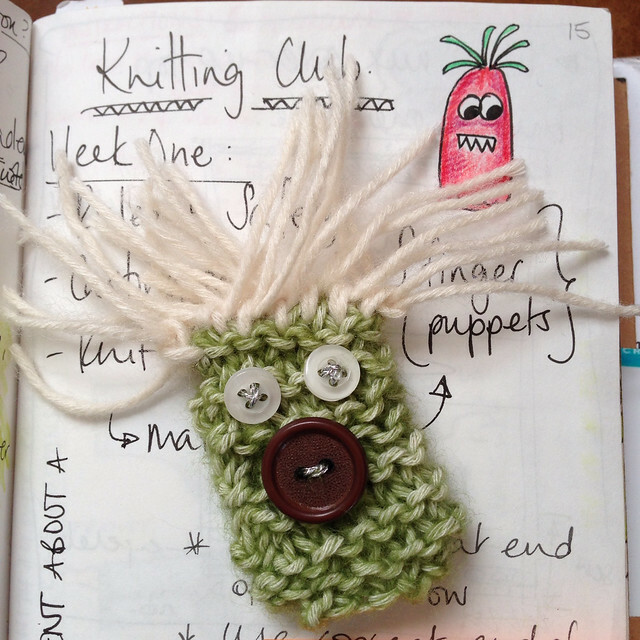 I like to use the knitting rhyme anytime I teach someone to knit, child or adult. I buy size US7 dpn's (Clover brand) and make little polymer clay balls for the ends and give these to new knitters. My favorite first project is a simple dishcloth (Grandmas" Favorite Dishcloth). What great ideas and inspiration! The puppets are so darn cute, and the knitting rhyme will surely come in handy. We are soon to start year 2 of "knit club" at the neighborhood elementary. Last year we had about 50 kids, 3-5th grade. We start with 5-6 rows of garter stitch on the needles for them, then they learn to knit, purl, bind off and finally to cast on. It seems to go really smoothly to have some stitches already on the needles as they learn how to manage the needles and yarn. We've started with throwing but I think continental is easier to do. The real treat in all of this has been getting time with these great kids in a non-typical way, some of the conversations have simply stunned us in what they cover and how much is in these sweet kids. A few years ago, I thought it would be a good idea for our Guides (all 36 of them!) each to knit a square which we could make up into a blanket for charity. I then suddenly realised we would need 36 pairs of needles and lots of help, as, probably, most of them couldn't knit! My mother-in-law, who used to do a lot of knitting, came to the rescue. We borrowed needles from wherever we could find them, and MIL and I cast 30 stitches onto each pair. We had a lovely evening when we started our squares. As I suspected, most of the girls had never knit before. A few had learnt before but since forgotten; only a couple could actually get on on their own! By the end of the first evening, almost no-one still had 30 stitches left. Some had 35, some had 25. One even had a beautiful lacy edge, complete with eyelet holes! MIL spent the rest of the week sorting them all out. However, we persevered, and everyone completed a square. (I think one or 2 Grandmas helped at home!) My MIL sewed up the squares and crocheted the edge and we presented our blanket to Wheels for the World, who take reconditioned wheelchairs to countries where people can't get one. They like to give a lap blanket with each wheelchair. All in all a very satisfactory result, if a little challenging at times!